“There’s essentially nothing you can make without water,” notes Seth Darling. 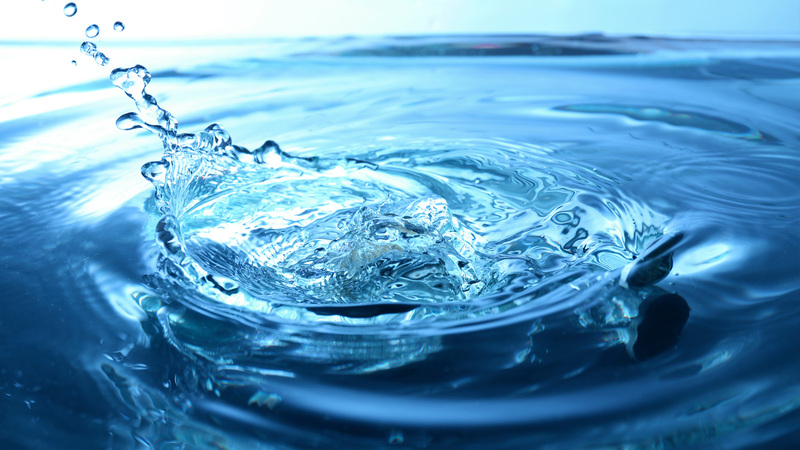 Darling is among a large group of researchers across the U.S. Department of Energy’s (DOE) Argonne National Laboratory who have cranked open the research spigot on one of the world’s most pressing problems — the availability of clean water. And as clean water supplies are increasingly stressed due to pollution, unsustainable extraction, and extreme weather events, demand is skyrocketing, particularly for more ​“fit-for-purpose” water — water of the required quality and quantity to meet demand as it’s needed, where it’s needed. Drinking water, for example, needs to be cleaner than water for cooling in a power plant. Argonne’s longstanding and deep experience in solving the most pressing questions in materials and chemistry research positions the laboratory to grapple with the challenge of increasing fit-for-purpose water supplies. The laboratory’s contributions span from basic research discovery to scaled-up manufacturing techniques that bring new technologies closer to market. Further contributing to the endeavor are Argonne’s interdisciplinary collaborative research centers and DOE Office of Science User Facilities, such as the Advanced Photon Source (APS), the Argonne Leadership Computing Facility (ALCF), the Center for Nanoscale Materials (CNM), the Argonne Trace Radioisotope Analysis Center (TRACER), and the Midwest Integrated Center for Computational Materials (MICCoM). These discovery engines are being mobilized to help the nation secure a plentiful and clean water supply. Last July, the DOE selected Argonne to lead AMEWS, a four-year discovery science effort partnering with the University of Chicago and Northwestern University. “The center examines the interface between materials and water, because so much happens at that interface, whether it’s sensing what’s in the water, or fouling of surfaces, or sorbents, or catalysis,” Darling said. Argonne also leads the DOE-funded MICCoM, which has begun to lay the foundation for new advances in water science and technology. Center Director Giulia Galli’s theoretical computation group began pursuing water-related research long before she accepted joint appointments at Argonne and the University of Chicago in 2014. As part of their research, Galli and her team have been using ALCF supercomputers to develop accurate and efficient computational methods to advance the study of water and aqueous solutions. “We look at the physical and chemical properties of water at the atomistic scale, trying to understand the basics of the bonds between the water molecules, how salts dissolve in water, and how water interacts with surfaces,” said Galli, an Argonne senior scientist and a Liew Family Professor of Molecular Engineering and professor of chemistry at the University of Chicago. Her group also contributes to AMEWS’ focus on better understanding the fundamental behavior of water at surfaces with the development of applications in mind, including water disinfection and catalysts to degrade water pollutants. But meeting those goals or creating those applications has its challenges, which AMEWS and MICCoM are collaboratively seeking to solve. Bolstering the transition of discoveries into technologies is the Directed Research Institute for Clean Water (DRINC), a consortium that includes Argonne National Laboratory, Idaho National Laboratory, and Lawrence Livermore National Laboratory, along with a variety of other academic, municipal, and industrial partners. Aaron Packman, director of the Center for Water Research at Northwestern University and water thrust lead in Argonne’s Manufacturing Science and Engineering Initiative, coordinates the Argonne component of DRINC. Packman cited resin wafer electrodeionization (RW-EDI) as one of many technologies that Argonne is developing to solve water and energy issues. A team led by Argonne’s YuPo Lin, electrochemical and bioprocessing engineer, invented RW-EDI as a highly efficient and specific desalination process. The team elevated the technology from laboratory to industrial scale using the capabilities of Argonne’s Materials Engineering Research Facility, demonstrating its promise for purifying salt water from the oceans, saline groundwater aquifers, and oil and gas processing into fresh, fit-for-purpose water. A big challenge is that predicted improvements in material performance at small scales sometimes fail to improve the performance of larger-scale water technologies. To overcome this challenge, Packman and his colleagues are trying to develop a hierarchical set of models that link how water interacts with materials at the molecular scale to the performance of large, real-world systems. 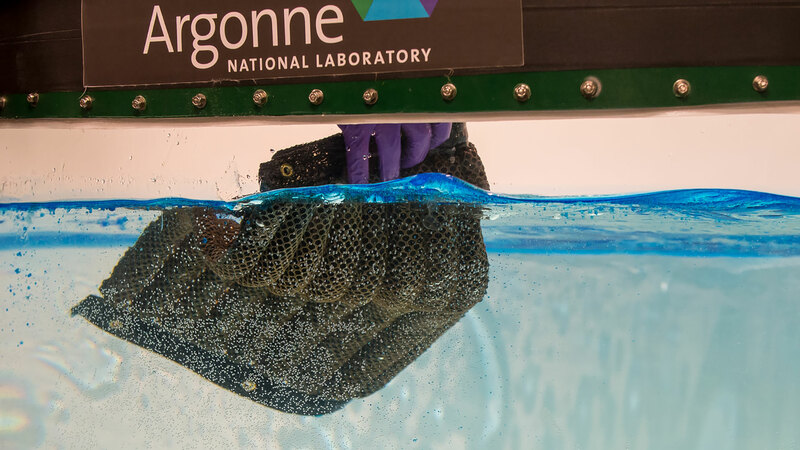 In April 2018, researchers from Argonne National Laboratory brought Oleo Sponge, a technology invented to clean up oil spills, to the natural oil seeps off the coast of Southern California. Other Argonne water solutions are based upon specially designed materials with the ability to extract pollutants and other impurities. The Oleo Sponge, for instance, has shown tremendous promise for cleaning oil spills from bodies of water—both on and below the water’s surface. The Oleo Sponge is opening a new technological frontier, having undergone successful tests last spring in real-world conditions in the Pacific Ocean, capturing oil sheen, an extremely thin layer of oil that coats the water’s surface and is traditionally tough to remove. Although different in composition, Argonne’s nanostructured marshmallow gel technology resembles that of the Oleo Sponge. Both technologies are ​“catch and release” — they selectively collect targeted pollutants from water and can be reused after the pollutants have been squeezed out. The gel’s porosity endows it with the capacity to adsorb up to eight times its mass. And scientists can easily vary the material’s composition to target different pollutants, including hydrocarbons, metals and pharmaceuticals in wastewater, said Ignacio-de Leon. The project started with oil-water separation as a possible method for developing biofuels. With further refinements, Argonne researchers found they could also adapt it for water purification, but with estimated operational costs that are much lower than conventional solvent extraction or distillation methods. The technology is versatile enough to be integrated with existing municipal treatment systems, and may be deployed in filters to remove lead from household water taps in communities like Chicago, Flint, Michigan and elsewhere, said Ignacio-de Leon. Supratik Guha, director of Argonne’s CNM, its Nanoscience and Technology Division and professor of molecular engineering at the University of Chicago, oversees two separate but related projects that apply innovative distributed sensing technology to water contamination issues. One project measures water pollution in three of India’s rivers using real-time data collection from mobile sensors. Launched on the Godavari river in 2017, the project has expanded to include the Ganges and Yamuna rivers. “We see the effects of sewage waste being drained into rivers,” Guha said. Mobile sensors continually map the high concentrations of sewage as hot spots on the rivers. Interactive data from the project is archived at thore​au​.uchica​go​.edu, a site named after the late U.S. naturalist Henry David Thoreau. The other project aims to measure E. coli concentrations in water through the development of silicon photonics, a technology that is much faster — nearly instantaneous — more accurate and less expensive than conventional methods. Argonne’s new technologies would make it easier to monitor and improve the quality of water, the material needed to make virtually everything. Entities with interest in learning about collaborating with Argonne in the water space — tapping into Argonne’s unique expertise, thought leadership, facilities and tools — should contact partners@​anl.​gov. The original research to develop Oleo Sponge was funded by the U.S. Coast Guard and the Bureau of Safety and Environmental Enforcement. The team used resources of the Center for Nanoscale Materials, a DOE Office of Science User Facility, in developing the material. The nanostructured marshmallow gel project is supported by the DOE’s Bioenergy Technologies Office, Office of Energy Efficiency and Renewable Energy (EERE). Scale-up of the Resin Wafer Electrodeionization technology is supported by the EERE’s Advanced Manufacturing Office. Separations research is funded by the Basic Energy Sciences program of the DOE’s Office of Science. The rivers of India project receives support from the Tata Centre for Development at the University of Chicago, and the DOE Office of Science supports funds the E. coli sensing research. The DOE Office of Science also supports the Advanced Materials for Energy-Water Systems Center. DOE’s Office of Energy Efficiency and Renewable Energy supports early-stage research and development of energy efficiency and renewable energy technologies to strengthen U.S. economic growth, energy security, and environmental quality.